The Weston Board of Selectman approved an agreement at its March 21, 2019, meeting. WESTON — A plan to renovate the Weston Police Department, Communications Center and Emergency Medical Services office is finally moving forward. With little discussion, the Board of Selectmen voted at its March 21 meeting to approve an agreement with Jacunski Humes Architects to begin architectural work on the spaces. The renovations will focus on the town’s police department, town hall and the expansion of Fire Station 1 for dedicated EMS office and bunk space. The total contract price for Jacunski is $135,000; of that, $27,000 would be paid only if the project enters the construction phase. The contract includes total cost of design development, construction documents and the bid phase. 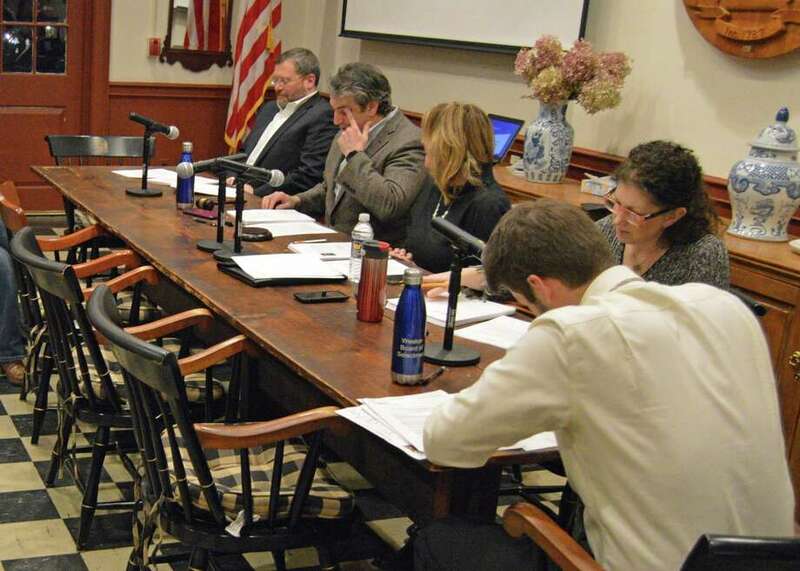 Discussions on updating the spaces go all the way back to 2013, when then-First Selectman Gayle Weinstein authorized a contract with Jacunski to complete an initial site evaluation and cost estimate, according to documents provided by Town Administrator Jonathan Luiz. Four four years, the town went through many different designs and planning phases, until an affordable option was agreed upon in 2018. A list of renovations was finalized in December, bringing the project total to $2,275,140. The bulk of the budget will be used to construct a new EMS headquarters facility, roofing and bathrooms, totaling $1,358,640. Also included is an expansion of the second-floor area at the fire department to include bunk rooms, a break room and conference room. About $589,500 will be used to cover police department renovations, including improvements to prisoner processing, booking, detention and evidence storage and handling, according to the documents. The Communications Center, located on the lower level of Weston town hall between the police and fire departments, will receive new roofing, flooring, ceilings, and improved bathroom, HVAC, interior finishes and lighting — totaling $82,000. Finally, town hall renovations would cost $245,000 and include new high-density shelving to house displaced file storage, a new break room on the lower level, and an accessible chair lift to to meet ADA requirements.